Right click text colors edited slightly. Hopfully this helps make the theme a bit more usable for some. Here is a screenshot showing the new URL bar. Trust me, it looks better installed. Tried to download it but there was a download on error. If Mozilla’s site throws an error, there is nothing I can do. Usually any issues fix themselves in an hour or so. Sorry. I’m getting a download error 228 when trying to install any theme from addons.mozilla.org, not just this one. Morete – That’s an error with Mozilla’s servers. Try right clicking on the download file on the addon’s site and saving it to your desktop. Then open the addon’s window and dragging it in there. Thanks for the tip on manual installation! I had a little problem with your theme, as the statusbar was light-gray with white text (I saw this same problem pointed out in a forum too). I know absolutely nothing of Firefox themes, but messing around with XUL and CSS I managed to come to a partial solution, which is modify global/global.css and comment out the “-moz-appearance: statusbarpanel;” line from “statusbarpanel” properties. I’m quite sure there must be more “elegant” solutions… but this is by now the only work-around I managed to find. Hoping it can help somehow. I’m liking the theme – but is there any way to not have the theme apply to the scroll bar? It’s affecting scroll bars in web pages and making them look odd. I found an apparent display problem with the theme. When you add a bookmark, the dropdown list of folders to add it to is unreadable until you hover your cursor over a specific folder. It’s not a result of my Windows theme, I tried the default and a few others to be sure. Also, it’d be cool if we could have an option to set the gradient colors for the URL bar… I have a hankering for a green like that of the header of this page, hehe. 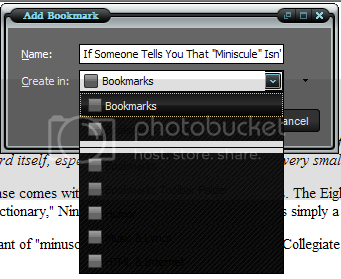 What’s up with a very faint texture that’s only showing up on my bookmarks toolbar? Hi. I just want to say that really love this theme, and it could be my favorite for Firefox, except for two things, I believe that the icons are really big, maybe you could create one version with small icons, but this is not a great problem, the other thing that I don’t like is the great amount of memory the theme consumes, specialy when you have many tabs opened, and I really hope that these small problems can be fixed in the following releases. TheChrisD – Nope, not without modifying the theme yourself. Gertlex – Good catch, please submit a bug report (see link below). Also, setting a custom gradient color isn’t an option right now, maybe in the future. One more, the very faint texture is just something to break up the large blocks of black. the100rabh – I have very little room to work with so I can’t just make the glow bigger without making all the buttons smaller. Sorry. Zootropoide – DId you set your Firefox icons to small? Also, the memory probably isn’t specific to this theme as I’m unsure why a theme would use more memory. I could be wrong though. All – Feel free to fill out bug tracker reports. Love the theme. Just one request: Could you make the bookmark bar and status bar match the shiny look? I don’t really like the criss-crossing lines on that one. Maybe for the next update? Jason – I’ll have to see how that looks. If I don’t do it, I can always give you code to put in your own edits via Stylish. Hi again, well, you were right in the referring to my complaint about the memory, sorry for the mistake, but I’m still thinking that the icons are a little big (and yes, I’ve tried to use the small icons option), maybe you could reduce them a few pixels, via the context menu like the Noia theme does, please? OK, I found Stylish. Now what do I do? (unless you’re going to include it in the next release). Zootropoide – I doubt I’ll make the small icons any smaller. Sorry. Jason – Try adding this code to Stylish. Make sure your cache is at least 1MB and clear it. Then try again to update. This worked for me. I love this dark theme! I was wondering if there is any way to change the color of the progress meter? I would love to change it to a bright blue color. thanks and keep up the great work!!! Thanks, but i don’t know anything about programing. Where would I enter that info? Gertlex – What are the chances you are also running some sort of dark theme on XP in general? I’ve checked my theme (disabled WindowBlinds) and there was no effect on the bookmark folder selection color. Are you not experiencing this GUI error? I’ll have to do some digging when I get XP back up and running.